Residents of Monongalia County that do not have access to public sewage and/or public water rely on individual on-site sewage disposal (septic) systems and/or private water wells. Environmental Health helps protect the health of the citizens of Monongalia County by regulating the installation and functioning of all on-site waste water systems and by evaluating potential water well sites before the well is drilled. This helps to protect the ground water, streams and creeks, and prevent the spread of disease. Sanitarians work with certified on-site sewage system installers to ensure that a site has suitable soil, sufficient space for the system, and that there are no other issues with the site that would prevent a on-site sewage system from being installed. Sanitarians also work with well drillers to ensure that a site is suitable for a water well. 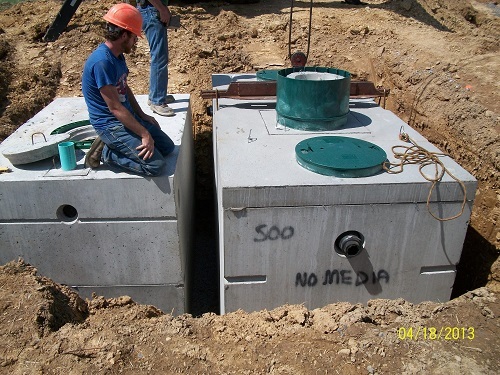 All on-site sewage system installations must be done by a Certified On-site Sewage System Installer. All water well drilling or abandonment must be done by a Certified Water Well Driller. The process for installing a new on-site sewage system, modifying an existing on-site sewage system, or repairing a failing on-site sewage system starts with choosing a certified installer. A certified installer will perform a percolation test and evaluate the site to see if it is suitable for an on-site sewage system or modification, or evaluate a failing system to see what repairs can be made. The certified installer will then make recommendations to the home owner/property owner for what type of system or repair should be installed. The homeowner/property owner and/or certified installer will fill out an on-site sewage system application and submit it to the Health Department. Once an application is received a Sanitarian will contact the certified installer to schedule a visit to the site of the proposed new system, modification, or repair. The Sanitarian will evaluate the site to determine if the new system, modification, or repair that the certified installer has proposed is possible and/or discuss any changes or corrections that could be done to make the new system, modification, or repair possible. Once the Sanitarian has approved the site a Construction Permit for the new system, modification, or repair will be issued by the Health Department. The certified installer may begin construction/repair of the system at that time. If the certified installer encounters any issues during construction/repair that would require them to modify the plan that was approved by the Health Department, they must contact the Health Department before continuing with construction/repair. When construction/repair of the system is finished, but before the system is covered up, the certified installer must contact the Health Department for a final inspection. The sanitarian will evaluate the completed system to make sure that it was installed correctly and in accordance with the approved construction plan. Many banks and other lending institutions now require that a home with an on-site sewage system and/or water well be evaluated to ensure that the sewage system is working correctly and/or that the water supply is safe before they will approve a mortgage or other financing for a home sale. The process starts with the lender or current home owner filling out an application for a home loan evaluation. Note: The home must have been occupied for the last 30 consecutive days and the septic tank must not have been pumped out within the last 30 days in order for a Sanitarian to do a Home Loan Evaluation. When an application is received a Sanitarian will contact the applicant to schedule the home loan evaluation. The sanitarian will take a water sample which will be tested to make sure that there are no coliform bacteria in the water supply. The sanitarian will also place dye tablets in the drains for sinks, toilets, tub/showers, and washing machine. This is done so that if any sewage is coming to the surface of the ground (which indicates a sewage system failure) it will be easy to see. The Sanitarian will make a follow-up visit 2 days after placing the dye tablets to see if there is any dye on the ground surface. After the Sanitarian has confirmed that the sewage system is working correctly, the septic tank will need to be pumped out if this has not been done within the last 3 years. If you are installing a new water well, modifying an existing water well, or abandoning an existing water well, the first step is to contact a certified well driller. A certified water well driller will evaluate the proposed water well site to see if a water well can be installed, modified, or to see what is needed to abandon a water well (abandoning of water wells is typically done when a person connects to public water or if a water well becomes contaminated.) The certified water well driller will then fill out a water well application and submit it to the Health Department. When an application is received, a Sanitarian will contact the certified water well driller to schedule a visit to the site where the water well will be drilled, modified, or abandoned. The Sanitarian will evaluate the site to ensure that the water well will be located (or is located in the case of a modification) the correct distance from the on-site sewage system and any buildings and that there are no visible sources of potential contamination in the area. The Sanitarian will also discuss the certified water well driller's plans for modification or abandonment of an existing water well. Once the Sanitarian has approved the site and/or plans for the installation, modification, or abandonment of the water well a Construction Permit will be issued by the Health Department. Once construction, modification, or abandonment of the water well is completed, the certified water well driller must submit a Completion Report or Abandonment Report to the Health Department within 30 Days. The Health Department can also test well water for the presence of bacteriological contamination if a person is concerned about the safety of their well water. Testing for chemical contamination must be done by a certified water quality laboratory. All vehicles that pump and remove sewage (Sewage Tank Cleaning Equipment) must have a permit from the Health Department. All sewage tank cleaning equipment must be inspected by a Sanitarian from the Health Department to make sure that it meets safety and sanitation standards. All sewage tank cleaning equipment owners must bring their sewage removal trucks to the Health Department at least once per year for inspection in order to retain their permit. The Wastewater Revolving Loan Fund is administered by the Monongalia County Commission and provides low interest loans to citizens based on income to repair or replace failing on-site sewage systems.